← Alaska – Get out and fish. Together. A sturgeon jumping out of the Suwannee River. FWC photo by Karen Parker. Gulf sturgeon have begun their annual migration back into the Suwannee River, according to Florida Fish and Wildlife Conservation Commission (FWC) officials. Researchers from the U.S. Geological Survey have reported that the fish began returning to the north Florida river in January because of the warm winter. During 2017, there were three reported sturgeon strikes, resulting in minor injuries to those involved. This year, a sturgeon encounter with a boat has been reported. There were no injuries. FWC officers will be on water patrol during the summer months in a continued effort to educate boaters about these jumping fish. Going slow is recommended to reduce the risk of impact and allow for more reaction time if a jumping sturgeon is encountered. And boaters are always encouraged to wear their life jackets at all times while on the water. Researchers have determined that the sturgeon jump to communicate with other fish and to gulp air to fill their swim bladders. This allows the sturgeon to maintain neutral buoyancy. Biologists estimate the annual population of sturgeon in the Suwannee River to be approximately 10,000 fish, averaging about 5 feet in length and weighing 40 pounds. However, a few can exceed 170 pounds. Sturgeon can leap more than 7 feet out of the water. Adult fish spend eight to nine months each year in the river, spawning in May, and then return to the Gulf during the coolest months to feed. 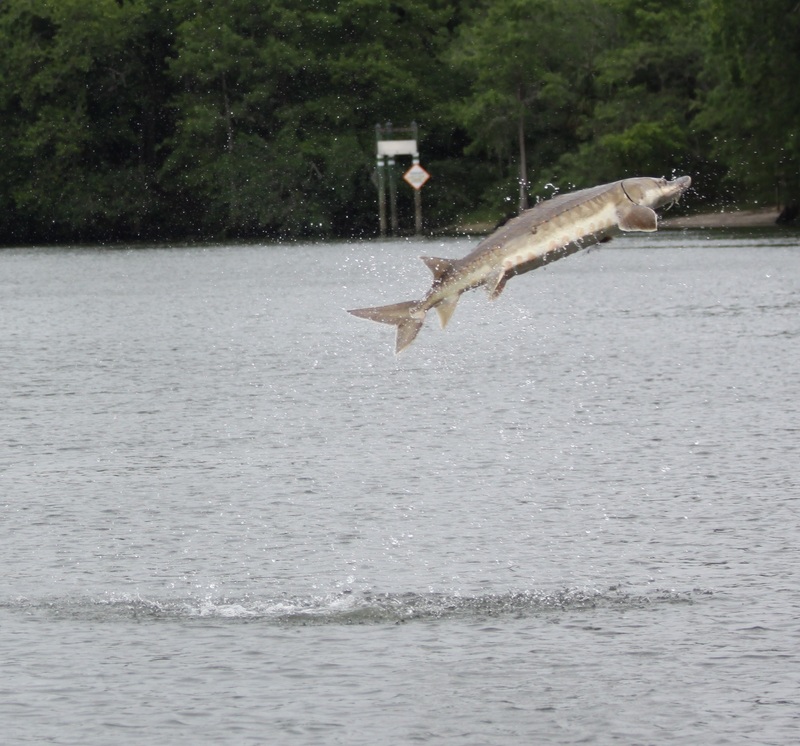 While it is possible for sturgeon to jump anywhere in the river, the fish in the Suwannee are more commonly observed jumping where they gather in “holding” areas. Major holding areas in the Suwannee occur above Jack’s Sandbar; below Manatee Springs; between Fanning Springs and Usher Landing; below Old Town Trestle; below the confluence of the Santa Fe and Suwannee rivers; near Rock Bluff; and below Anderson Springs. State and federal laws protect sturgeon, and they may not be harvested. To report sturgeon collisions, call 888-404-FWCC (3922).